British Prime Minister Theresa May is expected to ask lawmakers on Tuesday to allow her more time to negotiate the “backstop” protocol with the EU regarding the Irish border. 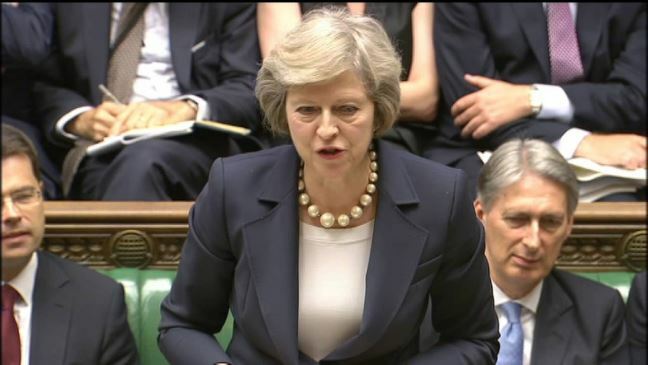 “The talks are at a crucial stage,” May said ahead of her planned statement to parliament. “We now all need to hold our nerve to get the changes this house has required and deliver Brexit on time,” she said. The backstop protocol guarantees an open border between Northern Ireland and the Republic of Ireland following Brexit. May said she will focus on negotiating changes to the backstop, which has proved the biggest sticking point in the Brexit negotiations. She suffered a crushing defeat in parliament when the draft Brexit deal was put to a vote in mid-January. “By getting the changes we need to the backstop; by protecting and enhancing workers’ rights and environmental protections; and by enhancing the role of parliament in the next phase of negotiations I believe we can reach a deal that this house can support,” May said on Tuesday. Parliament has been exerting increased pressure on the prime minister in recent weeks. Her latest appeal comes just two days before lawmakers are scheduled to vote on the parliamentary procedure for Brexit, but not the deal itself. May said earlier that she wants a “significant and legally binding” change to the backstop arrangement to prevent the creation of a “hard” border between Northern Ireland and the Republic of Ireland after Brexit. A hard border on the island of Ireland – including greater customs and immigration controls – would breach the UN-ratified Good Friday Agreement which brought an end to decades of political violence.